Sri City, October 18, 2016:- Paques Environmental Technology India (PETI) Private Limited, a wholly-owned subsidiary of the Netherlands-based industrial waste water management company, Paques, inaugurated a manufacturing base in Sri City on Tuesday. In a colourful function, marking the start of commercial production, His Excellency the Ambassador of The Netherlands in India Mr. A.H.M. 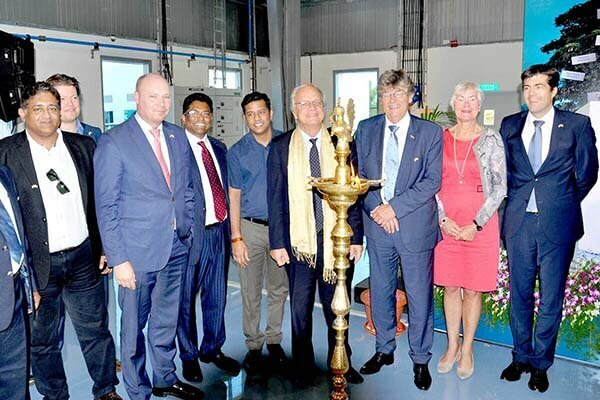 Stoelinga inaugurated the plant in the august presence of Mr. Stephan Bocken, Chief Executive Officer, Paques Holding BV, Dr. Jos Pâques, Founder & Major Shareholder of Paques, Mr. Sudeep Sangameswaran Managing Director, PETI, Mr. Ravindra Sannareddy, Founder Managing Director, Sri City and a host of other dignitaries. The company has plans for expansion of the unit based on the pace of business, particularly exports. To start with, the plant will provide employment opportunity for about 30 highly skilled persons to make core components, which essentially involved high-end engineering plastics, and this number might go up to 50 in future. Integration of water purification, sustainable energy generation and reuse of resources is becoming more and more essential, and Paques, as a market leader in the field of green energy has been developing cost-effective purification systems that reduce water and carbon footprints and reclaim valuable resources. It is one of the few major firms in the world which uses anaerobic technology for waste water treatment, in which the bacteria would convert organic compounds (COD) to bio-gas in an environment without oxygen, which is a green energy technology. It has more than 2000 installations in 60 countries, across different industries. Besides the Global and European headquarters in The Netherlands, Paques has regional headquarters in China, South America, India, South-East Asia and North America. This ensures local presence and the best service for clients worldwide.